With ongoing market speculation on Hanjin Group’s ownership following its chairman’s death on Monday, head of the country’s Fair Trade Commission said Friday it might delay the designation of the owner of the group. During a radio interview, FTC chief Kim Sang-jo said that considering the current situation, schedule of the designation may be delayed by two weeks to May 15. On May 1 each year, the Fair Trade Commission designates an individual or a legal entity as the business group’s de-facto chief, who it holds responsible for ensuring the group’s decision-making management and ownership structure comply with domestic regulations. “For a designation, there are many things to consider by receiving related documents from the group but I haven’t received any as the funeral has not been conducted yet,” Kim said in a morning radio interview. Citing the law here, Kim added that designation will be considered by reviewing the stock share, operation structure and corporate governance plans. 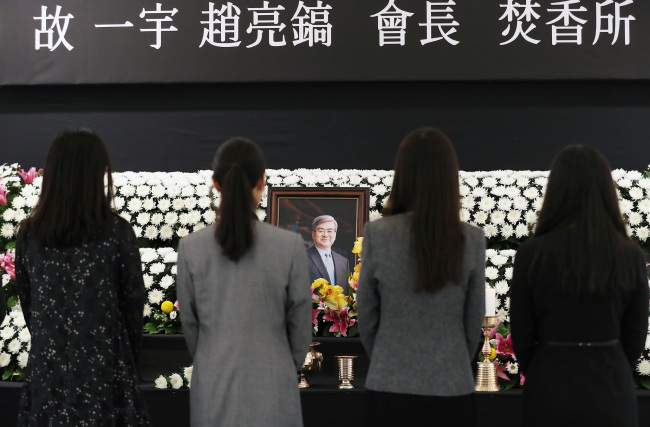 Market experts have been speculating that late chairman’s death will seat his only son and Korean Air CEO Cho Won-tae to the chief position of the group. Meanwhile, Korean Air said Friday that the body of the deceased chairman was transported from the United States to Incheon International Airport earlier in the day and moved to Yonsei Severance Hospital in Sinchon. The funeral will be extended through Tuesday, it added.